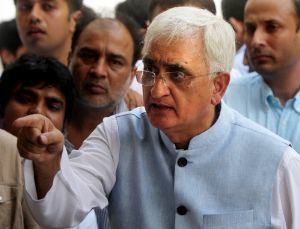 Prominent personalities of India, provided their comments to India Satire on Salman Khurshid's challenge for Arvind Kejriwal that he can enter Farrukhabad (Salman's constituency), but how will he return'? And I have worked with a pen but am prepared to work with blood. Few Indians felt that it was a funny statement made by Salman, few think that Salman was actually gay and forcing Kejriwal to stay there.